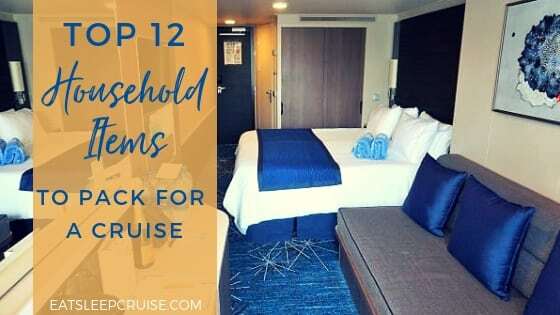 We want to thank blog reader and fellow cruiser, Mark Goepfert, for providing this week’s post on the Top 10 Things to Do on Independence of the Seas. 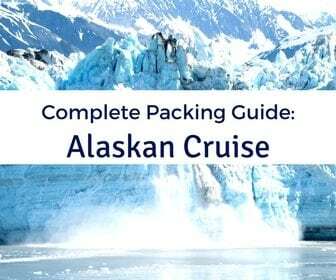 You can also check out a video review of his cruise here. 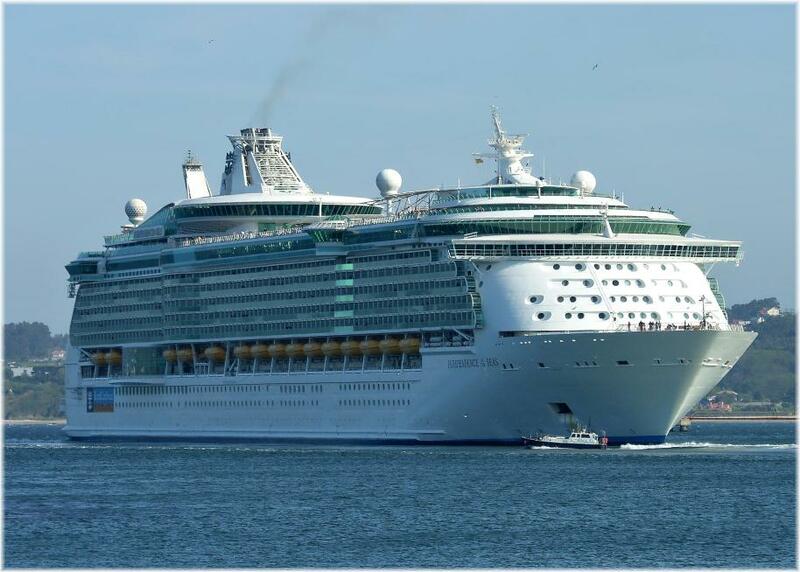 We recently sailed on Royal Caribbean’s Independence of the Seas which is the youngest of the Freedom Class Ships. 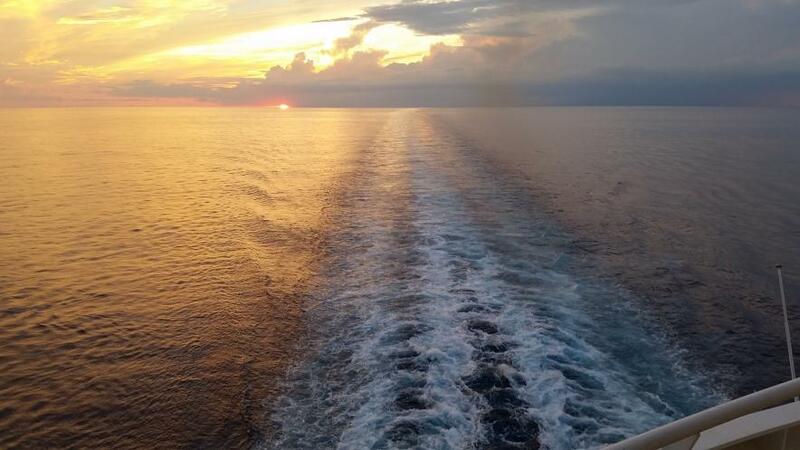 We sailed out of Port Everglades in Fort Lauderdale on a seven-night Eastern Caribbean voyage that included stops in San Juan, St. Maarten, and St. Kitts. 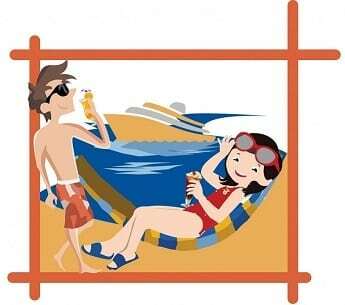 Here are our recommendations on the Top 10 Things to Do on Independence of the Seas. Not all ships are set up to allow you to walk around the complete perimeter of the ship from bow to stern, but this is by far one of our favorite activities! The deck is open air, but is covered to shelter you from the elements. You can start at the helipad with its phenomenal 270 degree views- also a favorite spot to enjoy the sail away. As you progress around the sides of the ship, you enjoy a certain sereneness that only the stunning blue ocean waters can provide. Since this deck (Deck 4) is lower than the open air top pool decks, you are much closer to the water. By the time you reach the stern, the view of the ship’s wake is stunning! Independence of the Seas offers dining at Chops Grille which is comparable to a high end steakhouse. It also offers Giovanni’s Table which is a family style restaurant specializing in Italian cuisine. For more casual fare, Johnny Rockets features burgers, shakes, and other 50’s type diner fare. 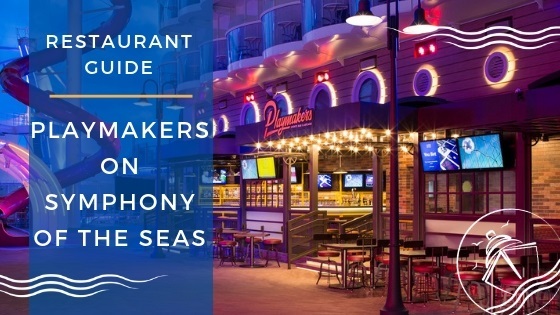 We took advantage of a package that offered a 30% on board credit for dining three times at these establishments (Chops has a $35pp cover charge, Giovanni’s is $25pp, and Johnny Rockets is $6.95pp). Our choices included two meals at Chops and one at Giovanni’s. 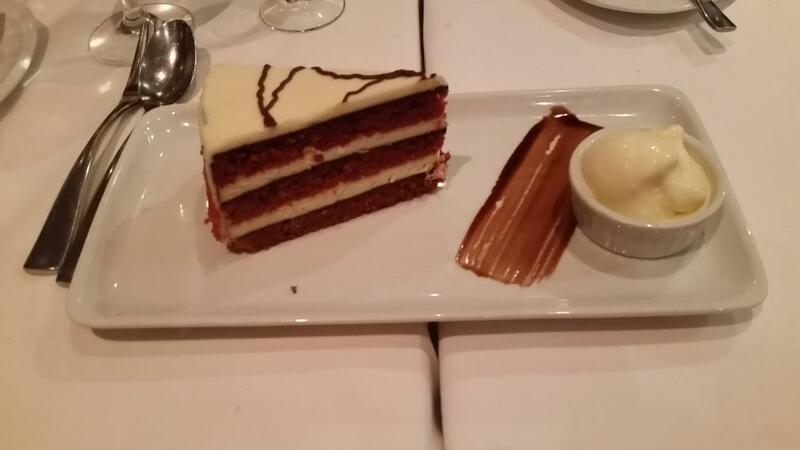 The food was exceptional and the service was outstanding! Our favorite part of these meals was the unbeatable views and fantastic desserts. We did not dine at Johnny Rockets but sampled one of their famous shakes – oh my, was it good! This was by far one of our favorite activities! Grab a cold beverage and some friends and soak in the views. 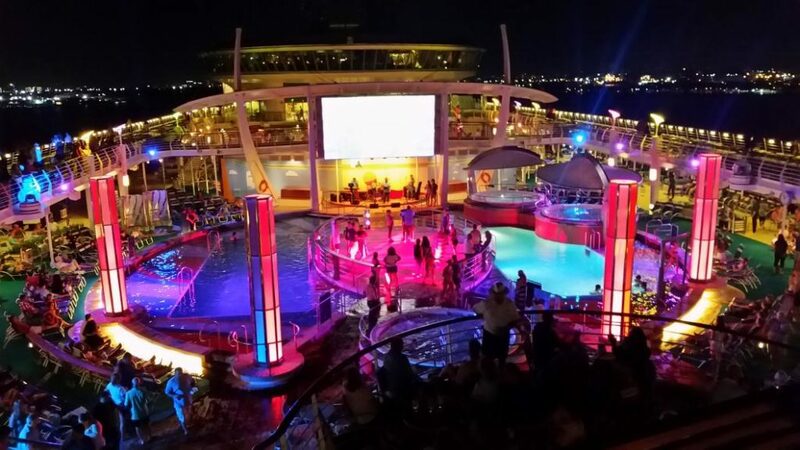 The most memorable one of our trip was an evening departure from San Juan that featured “dancing under the stars” with a poolside buffet and the sounds of a Latin salsa band providing the dance music. We were treated to phenomenal views of the illuminated El Morro Fort as we departed. We also loved the excitement of the initial sail away from Ft. Lauderdale and the beautiful volcanic island of St. Kitts. 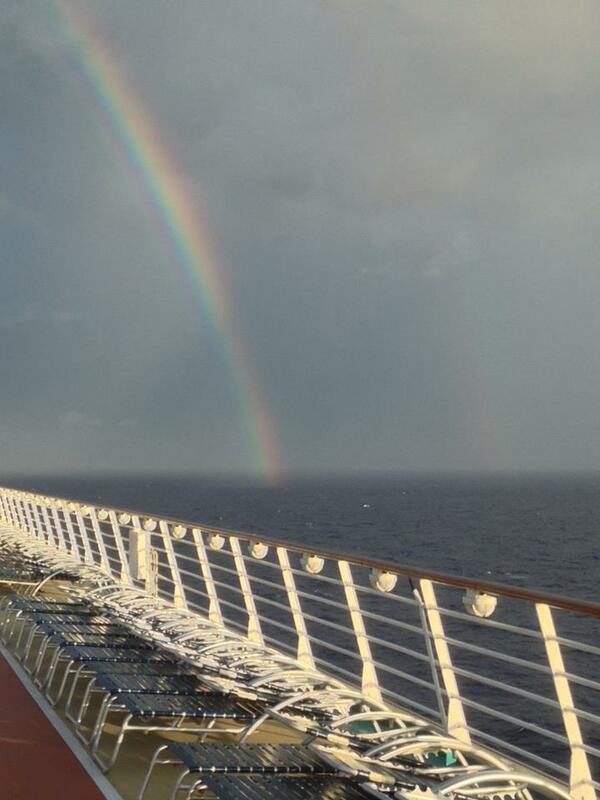 A brief rain shower even treated us to a gorgeous rainbow! 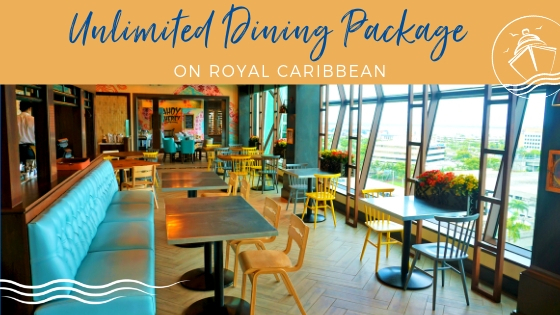 This party is clearly one of the highlights of any Royal Caribbean cruise- making our list of the Top 10 Things to Do on Independence of the Seas. On Indy, the party is held on the spacious Royal Promenade which transforms into a 70’s era disco inferno. 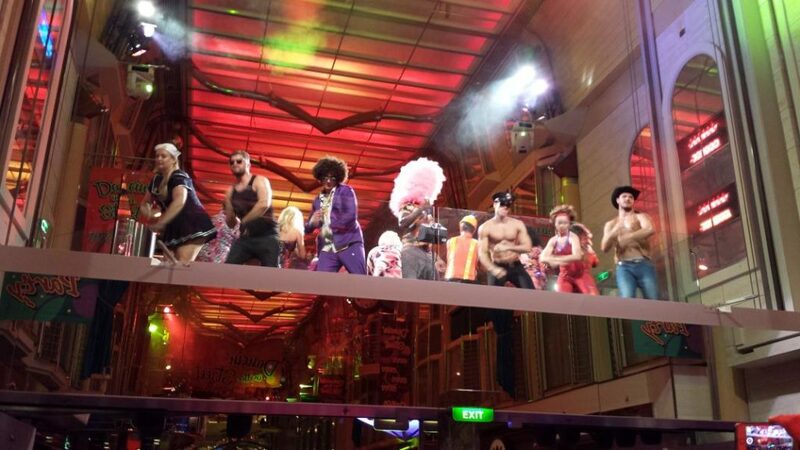 Members of the crew dress up as the Village People and descend on an overhead bridge to whip the crowd into a lively disco dance party – talk about high energy! We never really saw this wonderful meal publicized anywhere, but we found out about it from previous experienced cruisers. 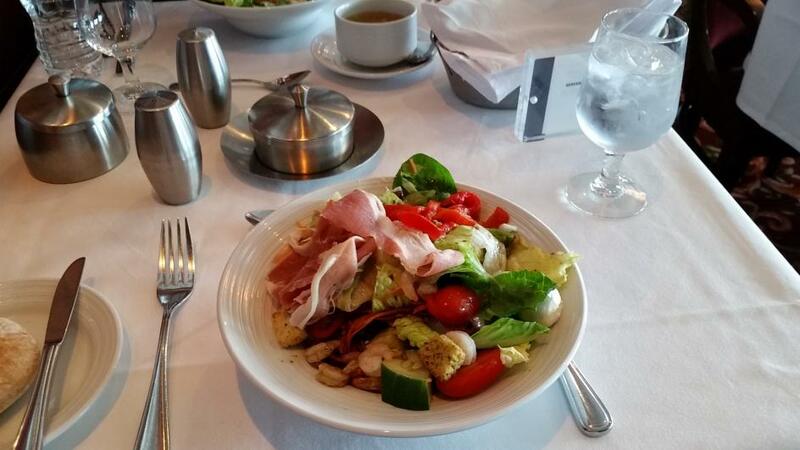 On Sea Days, RCI ships offer this made to order salad bar in the main dining room where you pick the ingredients and the servers compile your custom salad. Outstanding ingredients are typically offered – like shrimp, chicken, roasted peppers, eggs, and spinach! Not your typical salad bar – so tasty, it was amazing! 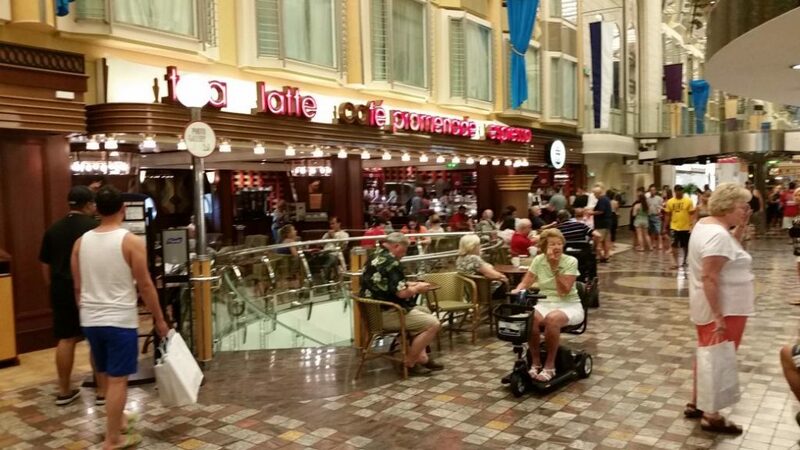 If you are looking for a little respite from the hustle and bustle of the Windjammer buffet, the Café Promenade is a wonderfully relaxing place to enjoy your favorite specialty coffee drink (most have a small charge) and some pastries or sandwiches. Inside seating affords wonderful ocean view windows with comfy seats, while seating in the Royal Promenade offers a great vantage point to people watch. This was one of our favorite places to meet up with friends and plan activities and excursions. 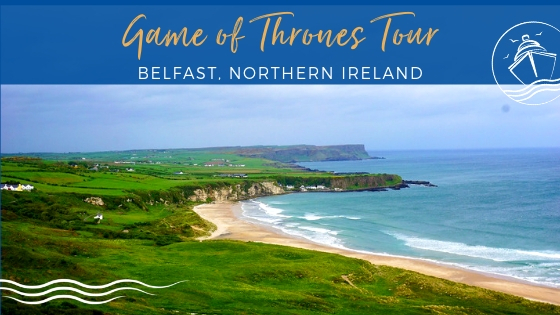 We were surprised and delighted with (of all things!) 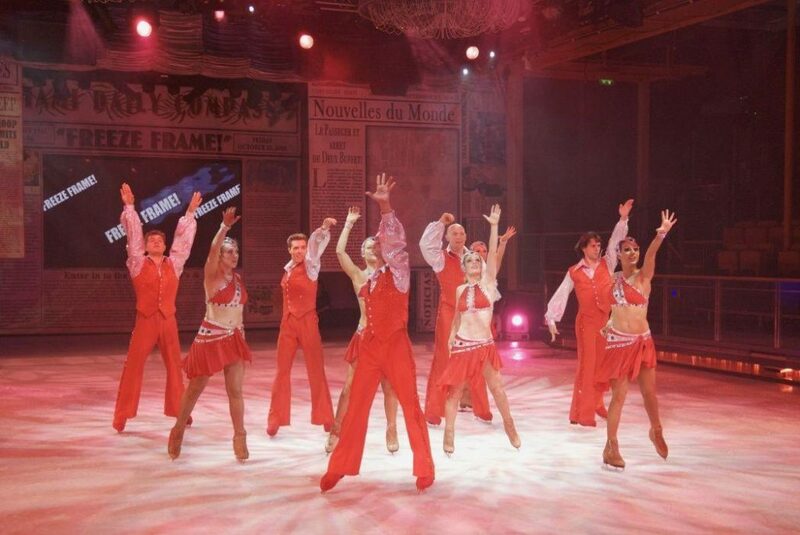 an ice show on a cruise ship. We went in as doubters but came out as believers. The show, entitled “Freeze Frame,” was very entertaining as it chronicled popular music through several decades in a well done production. It was well organized as you were assigned a performance time (in “Studio B”) according to your muster station. We did not make any of the other evening shows but were told by fellow passengers that they were very entertaining. They were performed in the spacious Alhambra Theater and included “Invitation to Dance,” (from the producers of Dancing with the Stars) as well as a Ventriloquist, “Once Upon a Time,” an Acrobat Show, and the standard “Love and Marriage” show. Our favorite was listening to a band called “Undercover” in the Olive or Twist Lounge (formerly the Viking Crown Lounge), high above the pool deck offering wonderful panoramic views. This band had an incredible catalog of music that included everything from The Beatles to 70’s funk to Southern rock…they really knew how to get the crowd singing and dancing! 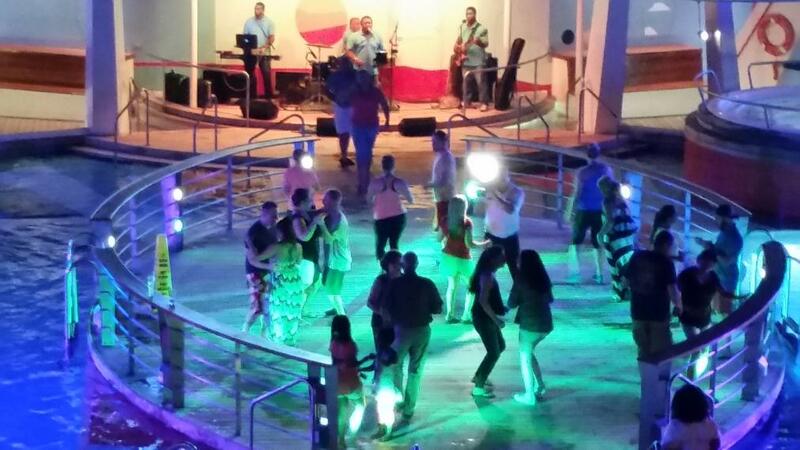 Other performers included a more intimate piano sing-along in the Schooner Bar and the energetic Latin Quartet that played sets by the pool in the afternoon and got all the salsa dancers going at the Latin-themed Boleros Lounge most evenings. Everyone seemed to really enjoy their lively music! 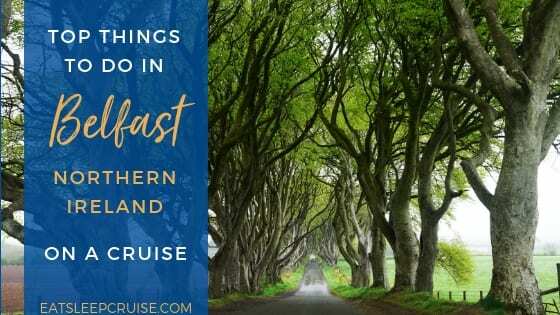 This is one of the most enjoyable parts of any cruise…it just seemed like Indy had numerous vantage points and well placed bars to grab a favorite beverage and admire Mother Nature’s show. What could be more peaceful and enjoyable? 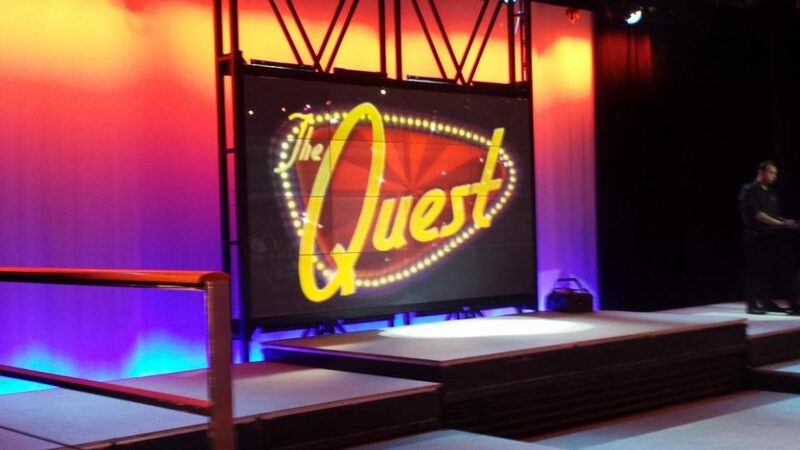 For those who have viewed or participated, “The Quest” does not need much introduction. For those who haven’t, it is a hilarious team-oriented game show that divides the audience into groups in search of trinkets or performing the “quests” that the emcee requests as quickly as possible to score points and defeat the other teams. 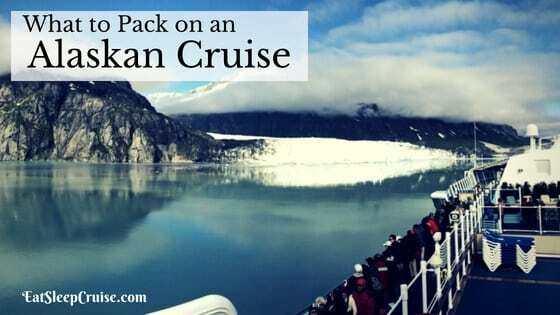 Done mostly for bragging rights, it is a staple of most RCI cruises. Indy’s was conducted in the stadium like atmosphere of “Studio B,” which allowed the emcee to whip the crowd into a frenzy. This particular Quest on Independence of the Seas was the most entertaining we have seen yet – we left the show in tears from laughing so hard! Our previous trips had been on RCI’s Radiance class ships which were much smaller and more intimate. 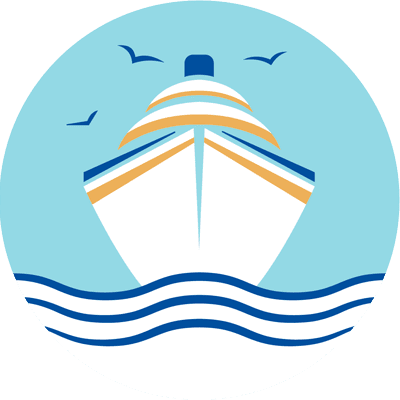 With that in mind, we were somewhat apprehensive about the size and number of passengers on Indy – going from about 2,400 to over 4,000. Yet somehow, even though our cruise was sold out, we never really felt like the ship was crowded. 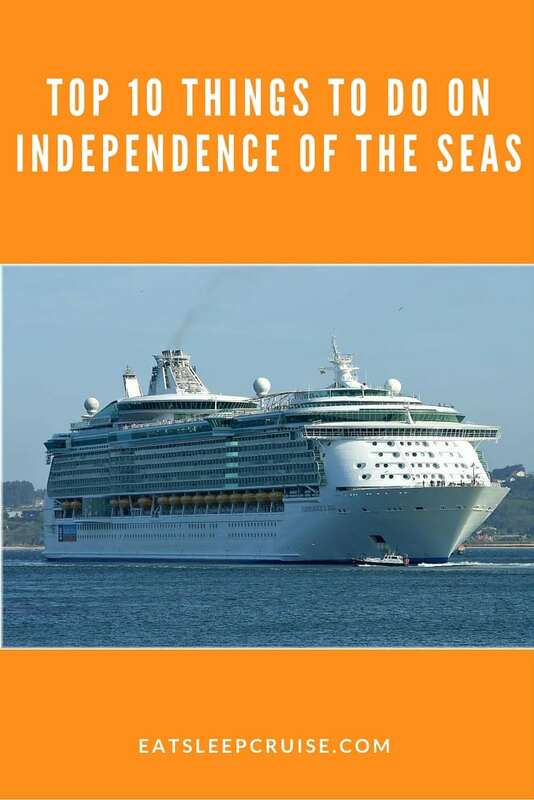 Kudos to the crew of Independence of the Seas for their outstanding service and variety of events that never made the ship feel much more crowded than the smaller RCI ships. The ship was always very clean and well cared for. We wouldn’t hesitate for a second to sail again on Indy or one of her sister ships. 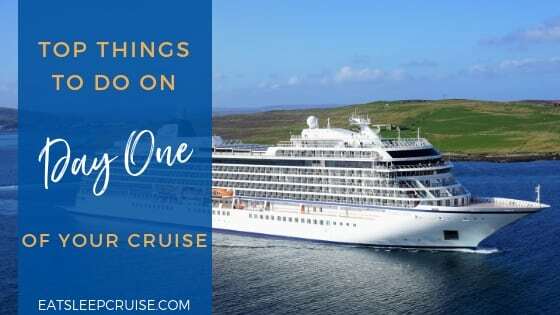 In fact, we enjoyed this cruise so much that we have now booked trips on Allure – which is even larger – and Anthem without any second thoughts about crowds at all. 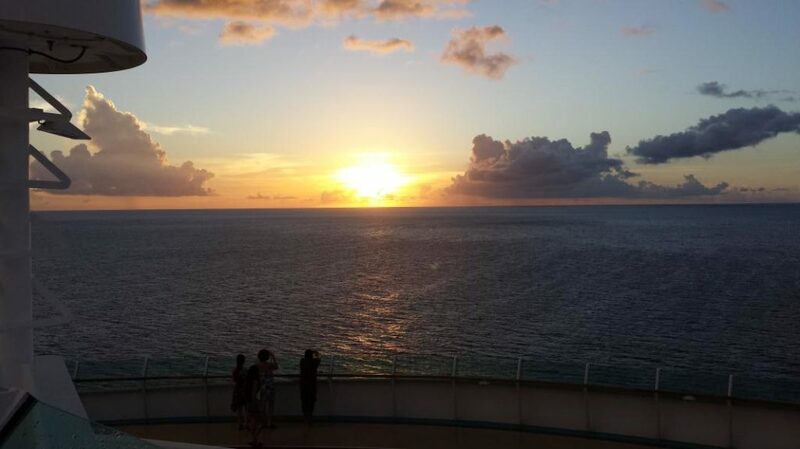 We hope you feel the same and consider Indy for your next cruise. Until then, Bon Voyage! Have you sailed on this ship? 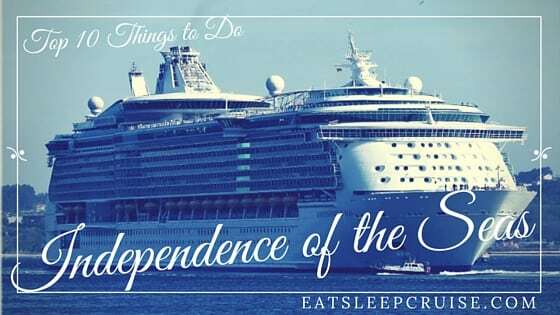 Do you agree with this list of the Top 10 Things to Do on Independence of the Seas? Drop us an anchor below, we would love to hear from you. Mark is relatively new to cruising. He and his wife Deb went on their first cruise in 2014 on Royal Caribbean’s Jewel of the Seas to celebrate their 25th wedding anniversary. Like many of us before him, he has developed a cruise addiction. 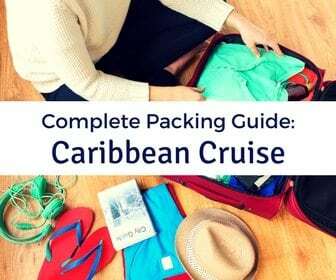 Since then, he has been on two other RCI cruises and plans to continue cruising twice a year in the near future. 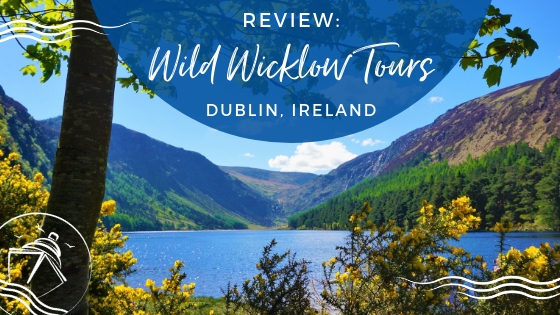 They have done an Eastern, Western and Southern Caribbean routes and future aspirations include eventually sailing to Alaska, The Mediterranean and possibly Hawaii and Australia/New Zealand. We sailed our first cruise this past November on Independence of the Seas for our 25th anniversary. Wonderful and absolutely the best trip we could have asked for!!!! Enjoyed your top 10. We did all but 2 of these!!!!! Looking forward to be back on the Indy in 4 weeks time! We love the Ice shows, but wasn’t sure about the Quest, however like you left laughing hard. Must say we are a fan of RCCL and hope to experience the Harmony or the Allure in the future too!